A distinguished practitioner of Odissi, Sujata Mohapatra made her initial foray into the dancing arena in her early childhood. Born into a rich cultural background, she grew up in an artistic environment that delicately nourished her creativity and brought out her innate interest in dance. As the disciple and daughter-in-law of Guru Kelucharan Mohapatra, she was blessed to inherit his ardent devotion and blind passion for the classical dance form. The eighteen years of rigorous training under the guidance of her Guru, eventually moulded her into a graceful performer. Apart from being an excellent performer, Sujata Mohapatra is also actively involved in teaching Odissi. Presently, she holds the designation as the Principal of 'Srjan' (Odissi Nrityabhasa), a prime Odissi dance institution founded by Guru Kelucharan Mohapatra. Sujata has obtained a Masters Degree in Oriya Literature from Utkal University and has also done research work at the Odissi Research Centre, Bhubaneshwar. Her ethereal grace, stylistic perfection and the spellbinding charm of her performances has won her whole-hearted applause from audiences worldwide. Her dance is renowned particularly for its unbending adherence to Guruji’s style, known for its tranquil grace, intensity of expression and technical perfection. An outstanding feature of her dance is its attractive sculpturesque quality. She has received Pt. Jasraj Award, Sanjukta Panigrahi Award, Mahari Award and many others. What makes abhinaya in Odissi uniquely lyrical? In particular, what are the distinguishing features of Guru Kelucharan Mohapatra’s style of abhinaya? 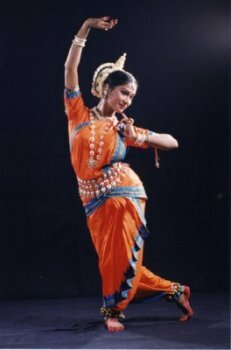 In Odissi dance, abhinaya has a particularly lyrical quality because of the Odissi parampara which has continued from the Mahari tradition of temple dance. Mahari dance evoked a combination of bhakti bhava and rati bhava which gave it a quality of freely surrendering to the divine through the emotions of devotion and of unconditional love. These sentiments still permeate Odissi abhinaya. Sculpturesque still points, circular gaits, and sensuous torso and wrist movements in Odissi technique, all lend softness and grace to the body while facial expressions have a subtle beauty. Guruji’s choreography had a particularly devotional quality because the strength of his own devotion to God flavored all of his work. While dancing, he elevated all members of the audience to a divine realm. He was an incredibly engaging dancer and brilliant choreographer of abhinaya. He had both an incredibly keen sense of observation and a great ability to translate specific moments from everyday life into very evocative choreography. His theatrical background gave him a great miming ability and each time he danced abhinaya he created a vividly imagined world on stage. Coming from a family of traditional painters, he was able to evoke bhava within a visual medium. He seemed to be an unending fountain of creativity, expressing countless subtleties of emotion through body language and facial expression. He was a Gotipua dancer so he was able to create artistic group formations on any mythological theme. All of these elements of his training combined to make his abhinaya flawless. The flow between his movements was so smooth, like an unbroken chain, that the flow of bhava was also unbroken. One could see in his work that all art forms are intimately related. As the Principal of Srjan's Odissi Nrityabasa, a mother, and a wife, how often do you get to practice? Why is daily practice essential for becoming a better teacher and performer? A woman playing many roles in life – a professional dancer, a mother, a family member, a wife, and a guru – undoubtedly faces challenges. It can be difficult to do justice to all aspects of life, and one has to accept all of life’s situations as they come. The key to all success is steadiness. If one is focused on one’s goal, whatever the hurdles, they can be overcome. Though one is a professional dancer, if someone becomes sick in the family, one has to think about what is one's priority. One must learn to handle each thing as it comes and to keep the passion for dance and the practice of dance very much alive. As a teacher, I always try to give my 100% to my students to the best of my ability. It gives me pleasure and satisfaction to contribute my time to put a drop of water in the ocean of Guruji’s dance. As a dancer, daily practice is essential if one believes as I do, that sadhana brings siddhi. The body is the dancer's instrument, and in order to dance confidently, one must tune that instrument daily. I am reminded of a proverb: "If for one day one doesn't do practice, one knows it oneself; if for a second day one doesn't do practice, then the guru knows it; if for a third day one doesn't do practice, then the public knows it." One's success as a dancer depends very much on the level of one's hard work. Without daily practice, one will never grow as a dancer; rather, one's career will be hampered. Knowing that truth, one realizes that daily practice is essential. It is said that Odissi dance has been undergoing a significant transformation in the past few years. What are some changes that you have observed, and are they beneficial for Odissi? Over the span of Guruji's career, his technique went through a series of refinements. Students who learned with him in the earlier phase would say that his dances had changed a lot in his later phase. However, Guruji did not like the word "change." He would prefer a term like "refine," "decorate," or "purify" to describe the process of maturation which took place in his work. He was an architect who never stopped refining his creations. Trained as a painter, he kept adding filigree to his choreographies and making his technique more and more precise. One example is in our basic chouk stance. Originally the feet were kept quite wide. Guruji said that the body's nature was to sway side to side with the rhythm, swinging the weight back and forth off of the center line. In order to perform the precise movements in feet and upper body while maintaining the center, it was necessary to dance in ardha chouk, with the feet in a smaller stance. I feel as a dancer and as a teacher that this was a positive change which helps us to maintain body control in the dance and achieve the subtle beauty which Guruji envisioned. I think that change and innovation are a necessary aspect of any art form and that Odissi is no exception as long as one maintains a strong link with the tradition. A teacher and a choreographer have a very serious responsibility to maintain the link with the artistic tradition which they have inherited from their teacher. One should think before teaching or choreographing about where one's work will lead three or four generations of dancers down the line. One also needs to always work from a strong text in abhinaya. We interpret text through dance and if the themes are classical, elevated themes, then the interpretation through gestures and body language will flow naturally in our classical form. It is possible to choreograph on contemporary themes, but they must have a strong text. My husband, Ratikant Mohapatra, has experimented with several themes which have not been done before and which have universal appeal including 'Om,' 'Bhaja Govindam' (based on the text of Shankaracharya), and 'Barsha' (which is from Kalidasa’s Ritusamhara). These works have all been widely appreciated because of their strong textual base. In group choreography, one has a lot of scope for innovation in terms of group formations and the use of spatial geometry which is being experimented with more and more in Odissi to great effect. Do you have a favorite piece that Guruji has taught you? Are there any fond memories of learning that piece with him? A very special role which I used to perform with Guruji was the role of Krishna in the dance drama 'Krishna Sudama' in which Guruji played the role of Sudama. My memories of performing that with him are very precious to me. Because he was so fully merged with his character on stage, I was able to transcend my own inhibitions about portraying a very intimate relationship between two old friends on stage along with someone who was not only my Guru but my father-in-law! He helped me to see that on stage we were no longer Guru and student, no longer father-in-law and daughter-in-law but two characters from mythology. A divine energy was created on stage while dancing with Guruji which is unforgettable. In life, a real guru can provide the divine light through his work which will lead you along a proper path. I had that experience with Guruji. He was not only my guru but my ideal. I didn't only learn dance from him but also many lessons about all aspects of life. I consider him as my living God and his blessings are like precious jewels which I cherish and carry with much respect.